At least 100,000 visas have been revoked in a single week in response to President Trump's executive immigration order, a lawyer for the Justice Department revealed in court Friday. The number came to light in a Virginia courtroom as a federal judge granted the state's motion to join a lawsuit challenging the immigration ban that caused chaos at airports over the weekend. 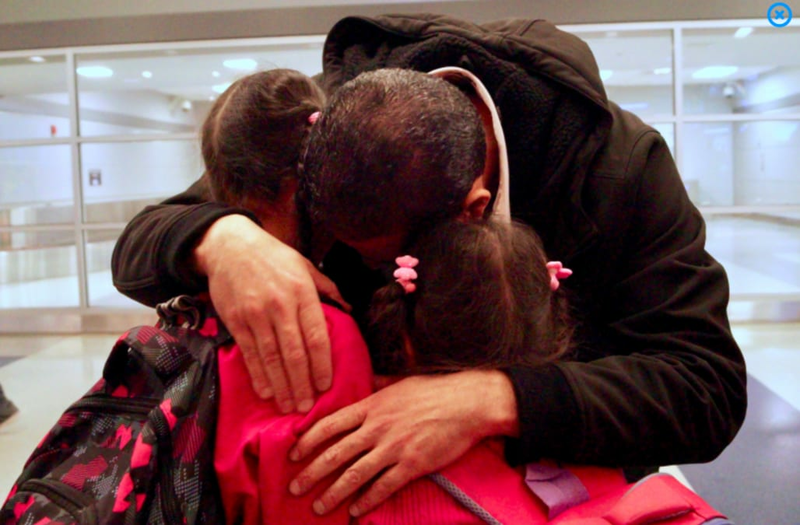 "The number 100,000 really sucked the air out of my lungs," said Simon Sandoval-Moshenberg of the Legal Aid Justice Center, who represents two brothers from Yemen who were detained after arriving at Dulles Airport on Saturday and filed the original lawsuit that Virginia just joined. Attorney Erez Reuveni, from the DOJ's Office of Immigration Litigation, announced the staggering number after Judge Leonie Brinkema pressed for the number of people who were detained and sent back from airports. Reuveni at first said he didn't know, then said "over 100,000 visas have been revoked." "I think you could almost hear the collective gasp in the courtroom when the government attorney stated that number," Sandoval-Moshenberg said at a press conference after the hearing. In light of the President's order — which banned Syrian refugees indefinitely, all other refugees for 120 days, and residents of seven Muslim-majority countries for 90 days — multiple court orders have been issued that rolled back some of the ban's heavier restrictions. In New York and Massachusetts, federal judges ordered CBP officers not to detain or deport travelers who had previously been authorized to enter the United States. Virginia Attorney General Mark Herring filed the motion on January 31, requesting permission for the state to join the existing Aziz v. Trump suit, which was filed on behalf of roughly 60 people who are either lawful residents or visa holders, yet were denied entry to the U.S. in the days after the ban. "As we speak, there are students at our colleges and universities who are unable to return to Virginia," said Herring at a press conference upon filing the motion. "We have professors, researchers, and employees at our colleges and universities and Virginia businesses who either cannot enter the country, or who will be barred from returning should they leave." The original plaintiffs in the case, according to the lawsuit, are two Yemeni brothers with visas who were "handcuffed, detained, forced to sign papers that they neither read nor understood, and then placed onto a return flight to Ethiopia just two and a half hours after their landing" at Dulles on January 28. President Trump has been named in at least 50 lawsuits since taking office January 21. On Thursday, in a separate legal action, affiliates from ACLU chapters in all 50 states filed a coordinated Freedom of Information Act request demanding to know how U.S. Customs and Border Protection (CBP) offices are implementing President Trump's immigration ban affecting seven countries — and the court orders that struck it down. The government says that all 109 travelers originally detained at airports last weekend have been released. But ACLU attorneys insisted that number is low; citing media reports and other evidence of more people being deported and simply disappearing somewhere between airports. Now, at least they know how many visas have been revoked. And the number is higher than anyone imagined. "Since this past weekend, CBP has demonstrated rank disregard for federal court orders limiting the January 27 Executive Order," Mitra Ebadolahi, Border Litigation Project Staff Attorney at the ACLU, told NBC News. "It is clear that CBP believes it can operate with impunity and continue treating innocent travelers with callous and inhumane disregard for their basic rights." NBC News asked U.S. Customs and Border Protection for a response to the charge of ignoring court orders and continuing to detain and deport travelers, but was told "CBP does not comment on pending litigation." While the FOIA request is aimed at CBP, it also seeks clarity regarding the overall implementation of the travel ban, citing the Department of Homeland Security's similar obscurity. DHS did not outright refuse to comply with court orders; its response was a confusing contradiction in terms. "We are and will remain in compliance with judicial orders. We are and will continue to enforce President Trump's executive order humanely and with professionalism. DHS will continue to protect the homeland," read the January 29 statement on the Department of Homeland Security website. The detailed request demands to see all agency communications regarding the executive order and following court orders. And it doesn't stop with email: the ACLU is asking to see every form of communication conceivably in use, from WhatsApp to Signal and direct messages sent on Twitter. That's going to be a whole lot of paperwork to sort through — the U.S. Customs and Border Protection has more than 60,000 employees, making it one of the largest law enforcement agencies in the world. "This coordinated FOIA request is an effort to ensure that the American people understand just how CBP is ignoring judicial orders and fundamentally undermining our most basic democratic norms and institutions," Ebadolahi said. "This agency must be held publicly accountable for its unlawful conduct." After weekend of chaos surrounding Trump's immigration ban, what's next?